In this document we will talk about reflection, introspection and customization in Java beans. These are the important aspects of Java programming language using which we achieve the dynamism at runtime. Construct new instances of classes and their arrays. Access the fields of objects or classes and modify them if required. Invoke methods on objects or classes. Access the elements of the arrays and modify them if required. 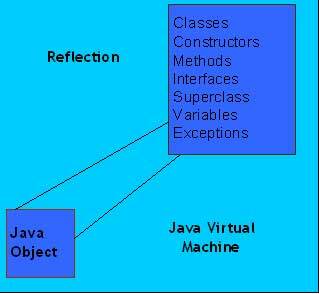 Introspection in java is used in the context of Java beans which defines the component model of java. Introspection feature enables a java bean to get the properties, methods and events of other beans at runtime. This helps the developers to design and develop their beans without knowing the details of other beans. Introspection and reflection are interrelated. Reflection is low level feature which allows our code to check the internals of other classes or objects at runtime. Introspection is based on this feature and provides a more convenient interface to check the beans at runtime. In fact introspection feature uses the low level reflection to check the objects internal attributes. Performance overhead: Since reflection uses the types which are dynamically resolved, some of the JVM optimizations are not performed. As a consequence, reflective operations are slower than the not reflective ones. Security restrictions: Reflection requires a runtime permission which may not be available while running within a security manager. E.g. an applet which runs under a restricted security context. Exposure of internals: Since reflection allows the code to perform operations which would illegal for a non reflective code e.g. accessing the private fields and methods, use of reflection may result in some unwanted side effects. Customization provides the feature to visually modify the java beans properties as per the requirement of the situation. Once the beans are designed so that reflection and introspection can happen, we should test our code to check whether these features actually happen or not. E.g. let us consider a clock bean. The user should have the power to customize it to digital or analog based on some property. Some visual builders e.g. the netbeans IDE use property sheets in order to customize the beans. Reflection was introduced in Java 1.1. Using these features degrades the performance of the program. The code becomes more open as the internals are exposed. Errors in method invocation are discovered at run time. In normal exercise these are caught by the compiler at compile time. The code becomes more complicated and it becomes difficult to maintain it.